New parents want to do everything they can to ensure their baby is happy and healthy. Unfortunately, illness is a normal part of early childhood. Moms and dads can prepare themselves by learning about health concerns for babies and knowing when it's time for a trip to the pediatrician. Babies face many similar health problems to adults. They may suffer from a cough or cold, congestion due to allergies, or, especially among formula-fed children, constipation. Infants also often experience reflux, which has symptoms much like an adult's indigestion or heartburn and usually stops by about 10 months. Parents can generally handle minor cases of diaper rash or heat rash with routine care. Colic, on the other hand, is one of the most common and yet most stressful conditions moms and dads might face. The extended, uncontrollable fits of crying are extremely difficult to deal with, but they usually end within a few months after birth. Other issues need be detected and managed as soon as possible. For instance, some cases of clicky hips, in which the baby's hip joint fails to develop fully, are minor and correct themselves over time. 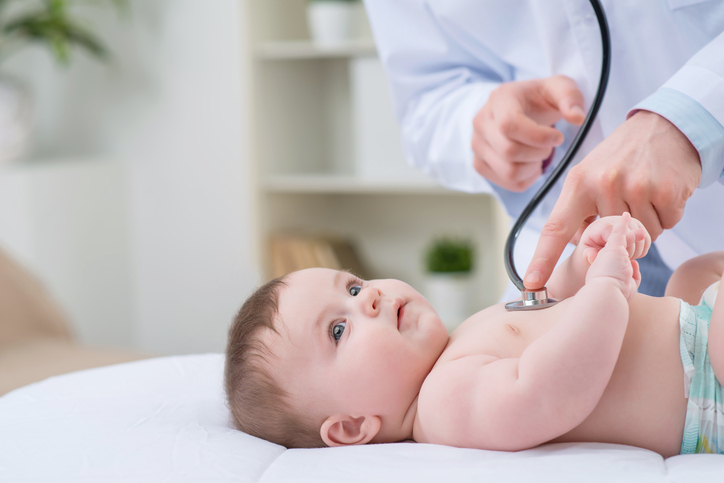 However, others require treatment, and it's vital to seek advice from your pediatrician. A new baby brings joy, but also a laundry list of worries about his or her well-being. Other common concerns include cradle cap, croup, jaundice, the squints, oral thrush and undescended testicles. In rarer cases, infants may born with rhesus disease. By learning more about these issues, you'll prepare yourself to take action and seek help when you need it. Constipation in Babies What is Squint? What is Cradle Crap? What Are Clicky Hips? Undescended Testicles in Babies What is Squint?